Most trails near Sedona explore the red cliffs and canyons in the wilderness areas north and east of town, since the land in the other directions has lower elevation, with far fewer exposed rock formations. One short, comparatively little-known path along the western approach, AZ 89A from Cottonwood, is the Schuerman Mountain Trail, which climbs to a viewpoint at the edge of a flat-topped, basaltic summit (an ancient volcano), overlooking all of Sedona and the Village of Oak Creek. The trail is not much used, and even fewer people continue beyond the viewpoint, across the open, grassy mesa top to the far side, and down to an alternative, western trailhead; both are along Red Rock Loop Road, which circles most of the mountain and is also used to reach Red Rock State Park. Views are the main attraction of the hike, though also of note are some columnar basalt formations, the best being along the cliffs on the south side of mesa, and a reasonable selection of wildflowers. Schuerman Mountain topographic map, Sedona location map. The main Schuerman Mountain trailhead is along the eastern section of Red Rock Loop, just a quarter of a mile south of the highway, along a little side road that leads to Sedona Red Rock High School. Overflow parking is available on the verge of the main road, also used for the Herkenham Trail to the east. The other start point is 1.7 miles down the western section of the loop. 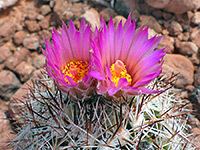 From the eastern trailhead, the path crosses a bushy, sandy area and runs alongside a fence bordering a solar panel array, past a colony of escobaria vivipara cacti, producing brilliantly colored pink flowers in spring. This is at the base of the mesa, and after here the route curves southwards up the hillside, through a patch of pinyon-juniper woodland then up a shallow gully, away from rim, to the mesa top, and a junction. 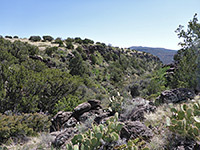 The actual highpoint of the mesa is to the northwest, reached by a faint, disused spur, but now the signed viewpoint is along an equally short path to the southeast, leading back to the edge of the mesa, ending amongst lava blocks mixed with a few trees. 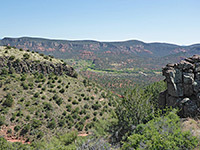 The vegetation is sparse, not obscuring the views, which span 180 degrees - from Bear Mountain in the north, across Sedona and the wide valley of Dry Creek, the red cliffs beyond town, Table Top Mountain in the foreground and across to Oak Creek valley in the south. Past the junction, the less used path continues southwest while descending gently alongside a dry wash, past a small earthen dam and a seasonal pool (Schuerman Mountain Tank), initially through bushy surroundings then into more open terrain where the main vegetation types are banana yucca and opuntia cacti. The land starts to break up into cliffs and ravines on the far side of the mountain, some parts of which are lined by the columnar basalt. The trail leads right to the southern end of the mesa - a narrow promontory - then drops down to a small parking area along the lower section of Red Rock Loop.